Writing blog posts was originally not supposed to be hard, but when my computer randomly presents me with the blue screen of death multiple times a day and crashes whenever I click the Start button, things get a little different. It sure is annoying when my computer gets more and more messed up each time it undergoes the evil Windows Updates. 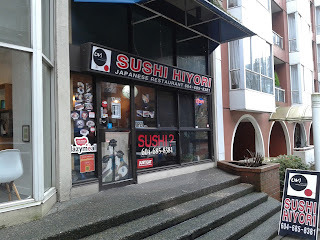 I was so exhausted after dealing with my computer's idiotic idiosyncrasies that I slept heavily through pretty much my entire one-hour bus ride to Sushi Hiyori. 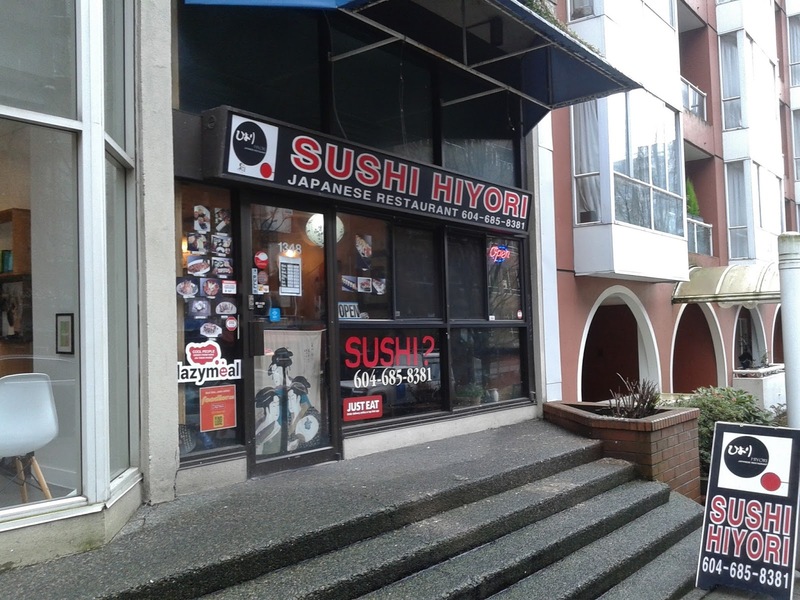 Sushi Hiyori is a Chinese-operated sushi restaurant on the south side of downtown Vancouver. I first visited the restaurant a few years ago when the cheap prices were what lured me in. The prices have gone up, and the restaurant looks a little more worn out than it did back then. There was also an ominous microwave situated right next to where I was sitting. However, the Japanese-themed decor and the wooden chairs and tables still made for a cozy atmosphere. The Salmon Sashimi was sliced into thick pieces, and although it did not have the richest flavour, it did have a nice smooth texture. The Tuna Sashimi was fresh and soft, but it was served a bit too cold. The sushi rice on the nigiri wasn't exactly the best since it was a bit dry and weak in flavour. 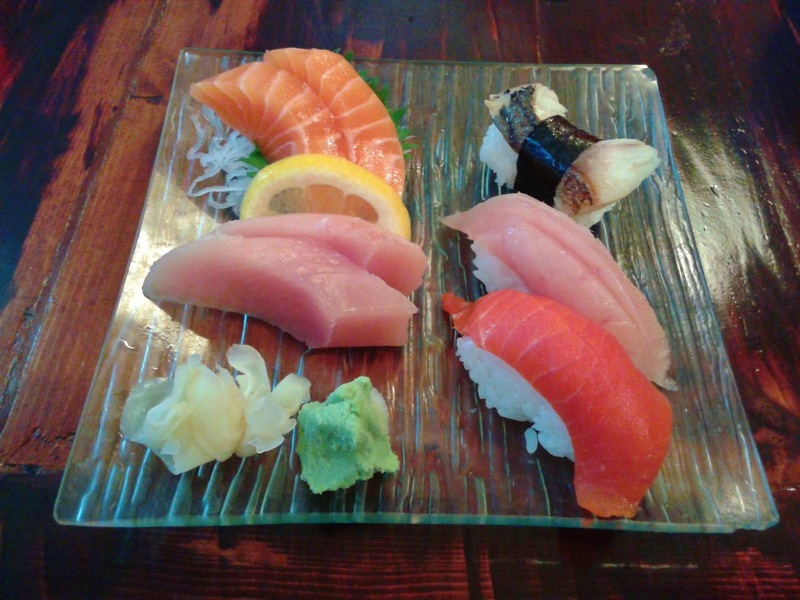 The saba was a bit salty, while the toro was not fatty and tasted just like regular tuna, On the plus side, the sockeye salmon had a delectable smooth texture. There was a large variety of special rolls on the menu, including a Memory Roll, which I considered getting in hopes of improving my terrible memory. However, it was a vegetarian roll, and since I didn't feel like being a vegetarian for a few minutes, I went for the Energy Roll instead because I desperately needed more energy. This roll was essentially a dynamite roll with fried unagi on top. The flavours of the ingredients worked well together, but the tempura was not crispy and tasted soft and bread-like. The roll tasted like it was microwaved. It also failed to provide me with much energy, as I fell asleep like a log on the bus again right after leaving the restaurant. 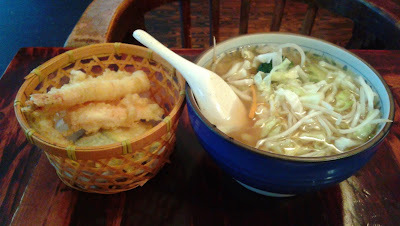 For my filler, I ordered the Tempura Udon, and thankfully, the tempura was not soaking in the udon broth. The lettuce and broccoli in the udon gave it an unauthentic flair, and the broth was rather weak with insufficient depth of flavour. The tempura was again soft and floury, just like the tempura in the Energy Roll. However, there was a generous amount of tempura, and the underlying ingredients, especially the two prawns, were fresh. The service was quite friendly, and at one point, the waitress even went around to help a few tables take group photos. The quality of the food had declined somewhat since my previous visit, but the raw fish has remained fresh. Overall, the prices are fair given the quality and the location, though I wouldn't say that this restaurant is a must-visit. Unfortunately, I'm pretty sure it's a hardware glitch with my hard drive, so I'm expecting the drive to completely fail soon. I'm saving all my stuff in Dropbox to make sure I don't lose important files! LOL I tried with that one... good thing I sort of have a decent vocabulary!